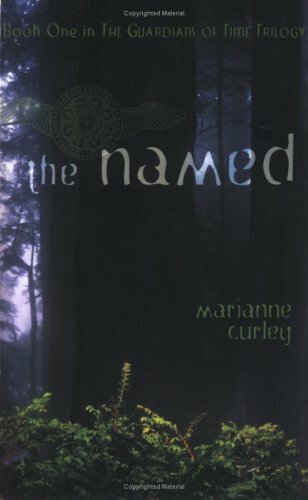 Marianne Curley made me believe that people can really time travel by reading her book, The Named. In this book of uncertainty and great ideas, not everything is what it seems. Fantasy and reality come together in this book where worlds and dimensions collide. The Named is the first book in the Guardians of Time Trilogy by Curley. The two main characters/narrators are Ethan and Isabel. The story is set in Angel Falls above the ancient city of Veridian. The story is in the present or near future, but sometimes the story takes place in the past in different times and places. The Named starts out before Ethan as he discovers his powers. He witnesses his sister’s death, which was caused by Marduke. He is a follower of Lathenia, the Goddess of evil and leader of the Order. The story continues to where Ethan is now 16. He goes to school and is aware of his powers. The story then switches point of view and Isabel comes into play. She has known Ethan since they were little kids because of his friendship with her brother, Matt. They eventually grew apart because they both liked Rochelle. However, she does not truly come into play until later on in the story. Ethan is training under the power of Arkarian, the coordinator of the Guard. He has the power to stay 18 forever. He has blue hair and violet eyes, but only because he is a Truthseer (can read the minds of others). He has his wings, which allows him to teleport anywhere just by thinking of it. Isabel becomes aware one day of her powers: the power to heal. Arkarian tells Ethan that he must train Isabel to be ready for the final battle between the Order and the Guard. She eventually becomes a member of the Named, a group of 9 who are said to fight Lathenia in the final battle. Ethan and Isabel go on their first mission back in time to make sure King Richard actually becomes king. The only way to go back in time is to go through the Citadel (palace with many rooms that gives you clothes and your identities that you need for your mission). They can only get there through their sleep, and only their souls go. There are many reasons why I like and dislike this book. The Named had excellent characters. I like how Mr. Carter ends up being one of the Named, along with Ethan. It is a great twist to the plot. I also like the actual idea of the book. The Named all have to time travel back in time to save the future from being changed by the Order. A negative to this book is that it ended very suddenly. Curley left many answered questions swimming around inside my head. The book fits into the fantasy genre for many reasons. It clearly identifies the evil and good characters, has a happy ending, has a problem that needs to be solved, and has a lot of make-believe. Isabel is close to dying at one point in the book. Only her soul-mate can save her. Who do you think it is? This was a class assignment over fantasy books. I'd never thought I would ever read something like this book in my entire life. But thanks to this project, it opened me up to consider a whole new genre.